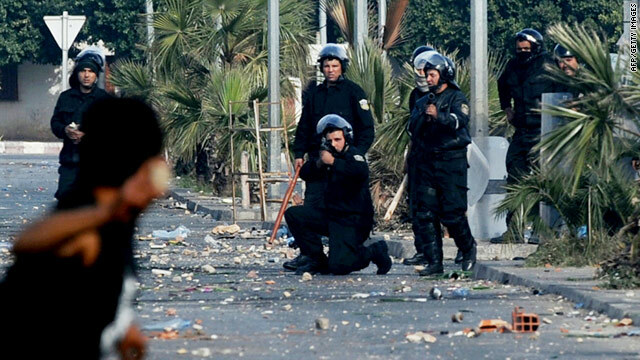 A member of the Tunisian security forces takes aim at a demonstrator on Monday in Regueb. Tunis, Tunisia (CNN) -- As clashes spread Tuesday, a Tunisian workers union called on President Zine el Abidine Ben Ali to order an independent inquiry into the deaths of demonstrators protesting high unemployment and poor living conditions in Tunisia. Union sources said the death toll had exceeded 50 since mid-December, but Minister of Information Samir Abidi said approximately 21 people were killed during two days of rioting in two Tunisian cities near its border with Algeria. He challenged Arab and international news media who were reporting higher tolls to provide a list of the dead. The unrest occurred in the cities of Thala and Kasserine, said Abidi. All of the dead were demonstrators; more than 30 police were injured, he said. State-run television and the information ministry reported that violent clashes between police and demonstrators occurred Tuesday in a suburb of Tunis. The union Tuesday demanded the release of demonstrators and said it will call a general strike in several southern cities in response to what it calls police brutality. It also condemned acts of vandalism. Amnesty International said Tuesday -- without citing a source -- that "scores" have been killed in the protests and at least 23 people died in protests over the weekend. The organization also said that "scores have reportedly been detained in the protests, with authorities carrying out mass arrests and night raids." Amnesty called for an investigation into the deaths and for those responsible to be punished. The demonstrations included demands for the government to improve social services. Tunisia's government called the protesters violent troublemakers. Tunisia has been ruled for 23 years by Zine el Abidine Ben Ali, an ally of Western powers and a target of activist and human rights groups that accuse him of running a corrupt police state that has infringed on citizens' rights. Reporters Without Borders said Tuesday that a number of journalists and bloggers have been arrested for reporting on the events. But Ben Ali said Monday that "certain parties ... have sought to involve our students and unemployed youth ... by spreading erroneous slogans of despair and concocting false news." In his second speech since the riots erupted, he said Monday on national radio and television that he was ordering the creation of as many as 300,000 jobs and called for greater freedoms for members of the news media. "These violent, sometimes bloody events, which caused deaths among civilians and injuries among security officers, were perpetrated by hooded gangs that attacked, at night, public institutions and even citizens in their houses," he said. "This is an intolerable act of terrorism." He said he would lower taxes on employers who generate new jobs. Tunisia's 14% unemployment rate does not reflect the true problems faced by the nation, said Abidi, the information minister. The government pays for college educations, but only about a third of the 80,000 students who graduate each year from the nation's universities are able to find work, he said. As a result, he said, unemployment among college graduates hovers around 25%. The wave of demonstrations was sparked by the suicide of an unemployed college graduate in December. Mohamed Bouazizi, 26, set himself on fire in front of a government building in the town of Sidi Bouzid after police confiscated his fruit cart, saying he was selling without a permit, according to Amnesty International. In an interview with Al-Arabiya carried out Tuesday in Dubai, U.S. Secretary of State Hillary Clinton said she regretted that Tunisia on Monday summoned the U.S. ambassador to Tunisia to express its discontent over U.S. criticism. "What the ambassador and what the State Department back in Washington did was just express concern that this is a protest that has, unfortunately, provoked such a reaction from the government, leading to the deaths of mostly young people who were protesting." CNN's Richard Roth and Elise Labott contributed to this report.